“Many of these boomers are going to need care going forward and the millennials are going to have to care for these boomers because they are the sandwich generation between the (baby boomers) and the kids. How are you going to make it all work,” Nooyi said. “How are we going to redefine what is family, how we share each others' time to create a more nurturing environment,” she said. When asked how she would take the idea and put it to work and whether one should expect her to run for office, Nooyi replied, “No.” Nooyi stressed that care workers, who typically earn less per hour than they would working at a local convenience store, are opting to work in a more social environment as opposed to doing care work for children and elderly people. "That's going to create a massive care shortage for us. We are going to have a million caregiver shortage - between aging care and child care - in a couple of years. What are we going to do.” She said companies need millennials in the work place because otherwise the productivity of the country is impacted. “We need women in the workplace” but society also wants the millennial women to have two kids each to make sure the population is replaced the right way. "But we cannot expect you to have those kids if we don't give you the support system," she said to another round of applause from the audience. “This is a real issue that as countries, companies, communities, families and societies we have to figure out a sensible way to come together and come up with true policy options and start working on this.” “If we don't come with up some systemic solutions to address this issue, there is going to be a crunch,” she said. “Now the real question is how do we bring the right people around the table to say this is the set of solutions that will work and this is how we can pay for it.” Nooyi said she is encouraged by efforts in Washington to look for solutions to the crisis, including through the many childcare bills making their way through Congress, paid family leave and support systems required for caregivers. “We have to stop talking about this as a problem, we have to get to what is the solution, demand answers,” she said. Nooyi emphasised the critical need for employees, particularly women, to find how to strike a balance between children and work while working to move up the career pyramid. She stepped down on October 2 last year as PepsiCo's CEO, after 24 years with the company, the last 12 as CEO of the global beverage giant. 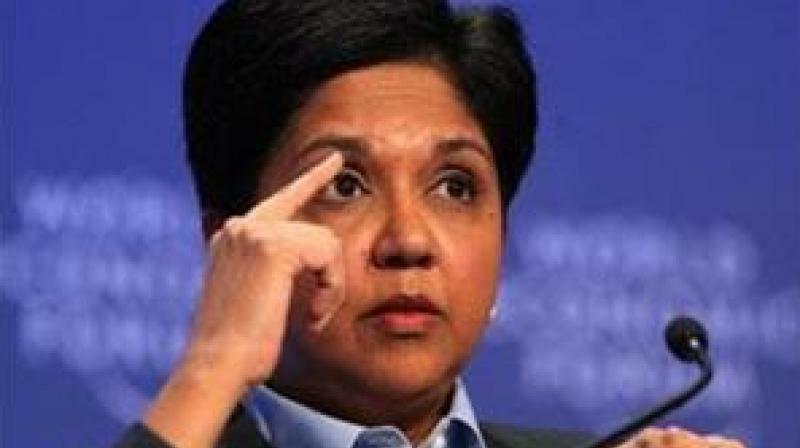 Nooyi said when she joined PepsiCo in 1994, her eldest daughter was around 8 years old while the younger one was nine months. "I was in the middle of this large scale transformation of the company between 1994 and 2000, working 24/7,” she said, adding that she decided that after 5 pm, her kids were allowed to come to her office to be with her, play and sleep in her office. "That's the price of having me work at PepsiCo because if I couldn't go home and take care of the kids, my office was going to become the place where they will hang out,” she said. When asked if her bosses were okay with such an arrangement, Nooyi, who was then Head of Corporate Strategy, said to an applause, “Did they have a choice. If you want me, that's the price of having me." “It comes down to, if you establish a niche for yourself that you are competent and make yourself indispensable based on competence, what can they do without you. If they didn't want me because they didn't want kids running around, then get somebody else, get a guy who couldn't do the job as well,” she said. Nooyi said she faced “zero” resistance to this approach of hers and even her boss, then Pepsi CEO Steven Reinemund “always helped” her out during instances when she had to attend to both her daughters at the same time. “When you have bosses like that, it's a piece of cake,” she said.